New & Improved:The new look is up and running for everyone to enjoy! The new and improved DS now has an updated grid style look, with things more simplified. The main features are still here but a few things have changed and new features in replacement for removed stuff. Everything is accessible from the home, I'll also be adding small excerpts so you can get a quicky look at stuff such as blog posts and trending fashions. We now have a simple system that basically offers designing, exploring/showcasing, shopping, and socializing. The studio and shop have stayed the same for now along with the features in them. Explore lets you look through and show off fashions, boutiques, and outfits. From those categories you can look at other members posts or show off your own stuff. Taking advantage of the new grid style, you can post an image right at the top of your post and it'll show up on the main grid. So overtime we will have grids full of fashions, boutiques, and outfits. Ingenious idea right? lol Thank you it was the best solution I could think of to simplify things! Society now offers contests, members, and talking. 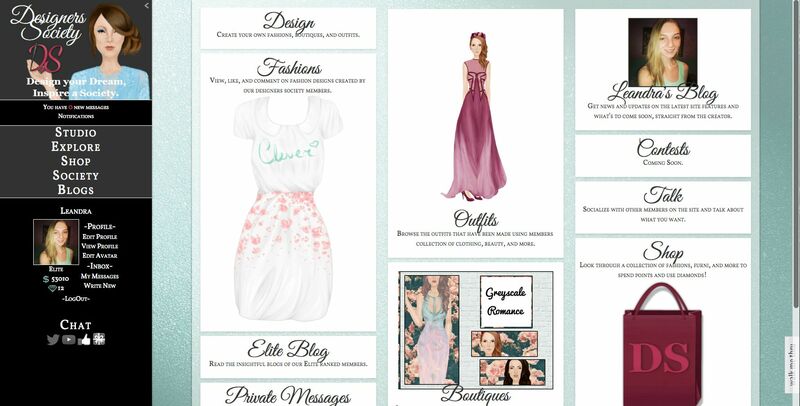 Talk just offers another grid style blog system so you can all chat about what you want. The Blogs are self explanatory and help showcase elite and my blog. Diamonds: We have a new experience system finally! It makes things easier than worrying about awards. While they were fun to earn, they were really hard for our team to try to keep track of. Diamonds can be earned by getting likes when you post items in the explore section. Diamonds work as a 'like' system and no one loses them, ever. So all you have to do is post fashions, boutiques, and outfits then if members like them you'll get a diamond for each like. All of that is automatic(yay) and on the post you'll be able to see how many diamonds it has earned. Now it's a two way street here, you should explore and like other members posts and socialize with them. Then the more likely they are to return the favor! For this system to work it's essential that members use it. So all you have to do is look around and when you click on a post you'll see a big "Like Post" button with a diamond at the top and bottom of the original post. So if you really like their fashions, outfits, boutiques then you should like so they can earn a diamond! You can see your number of diamonds on the sidebar menu now as well as on your profile and posts. Diamonds will be used as experience to earn different ranks. I haven't worked that all out yet, but as soon as I do I'll update this post. 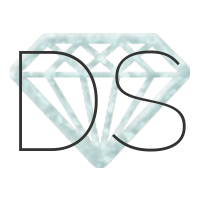 Diamonds will also be used to earn you lots of perks like free fashions from society stores and more(basically like points but not spendable)! Now to move onto the other new changes, I'll make a quick list. One last note... Monthly featured items will be added to the home as the image for Fashions, Boutiques, and Outfits. No special entry needed, I'll choose them from the explore pages. So even more incentive to post your designs, they might be chosen for the home! Any questions or comments on the new and improved, just leave them below! Note: Here is a picture of how the website should appear. If there are any issues with yours please let me know so I can fix them! Update: Diamond likes now have a counter that shows how many likes that post has gotten. This only appears after you like it, or if you're the poster it'll show right away. Note: Usernames with hashtags won't work. Are points rewarded for uploading a fashion in the gallery area. This might promote more design uploading. Right now fashions in the gallery are listed alphabetically by designer name. Items have not changed much so right now I'm only interested in new items. Is it possible to organize them by most recent date? I just had to re-log in and I was taken to the old forum page. I have to say that I really miss it! Everything new was on the one page and you didn't have to go to each section to often re-read the old stuff. It also let you see who was online. Maybe I'm crazay but I really like knowing who's out there! @fries The chat has been updated so it may not work on mobile. It's the newest version and the creators are still working on it so they may not have mobile worked out yet. Try what Art says though that might be all it is too. Otherwise you can use the basic chat here: http://www.designerssociety.net/chatbox/index.forum? Also, I was thinking since a lot of people have threads for their own designs, maybe you could make it so that in the fashions section we can like or give diamonds to certain posts after, not just the first one. Like if Desert posts a design that I like, I can like that one post instead of liking the original one. And I can give more than one diamond to her in that thread. And I think the new layout works a lot better on mobile than the other one! @Pink Well the username tagging is a new feature from my host, so I can't control that too much, but I do like the idea though. As for the liking different posts, I could add it for comments but didn't for now since then it might make diamonds over used. For example if everyone just starts liking each others comments because they said they liked their fashion. Then really the person didn't do anything to earn the diamond, just compliment them. I'm not sure I might change that down the road, depending on what you all think of that too. I just don't want the diamonds to get misused or over amounts since they just gain overtime and would lose value if they're too easy to get. @Leandra: Okay :) I understand how they might get misused, I didn't think of that. Also yes I know there's a slight issue with the like/diamonds overlapping text when you haven't liked it yet. I'll get to that tomorrow, if you wanna like something you still can click there to like it. Then it'll just show the number of likes after that. is the chat just down for me or is it for everyone again? Yeah same here it must be maintenance, I sent in a question to the creators so hopefully I hear back soon or its fixed.